Like most women, she’s got obligations stacked tight from dawn to dusk. To combat the crush of reality, she’s turned to romance as her primary source of escape ever since she cracked the spine on her first Christine Feehan book years ago. 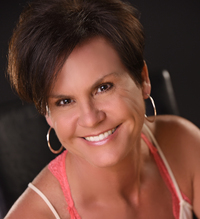 Whether it’s contemporary, paranormal, or fantasy you’re after, Rhenna’s stories pack new, exciting worlds, and str A native Oklahoman with two beautiful girls, Rhenna Morgan is a certified romance junkie and has a resume that reflects her passion for new experiences. Since graduating with a Bachelors in Radio, Television, and Film at Oklahoma State, she’s racked up positions ranging from on-air radio talent, skip tracer, and promotions director, to real estate agent, project manager, and business analyst. We’d love your help. Let us know what’s wrong with this preview of Down & Dirty by Rhenna Morgan. "I don’t usually care about musicians, but I couldn’t resist reading Axel’s book! I love the Haven crew. " Since I first started reading Juliette Cross’s Vessel Trilogy, I’ve been in love with this world and these characters. But the spin-off Dominion Series? And this book? They are even better! Crazy hot with all the feels. Xander and Bones were the perf Since I first started reading Juliette Cross’s Vessel Trilogy, I’ve been in love with this world and these characters. But the spin-off Dominion Series? And this book? They are even better! Crazy hot with all the feels. Xander and Bones were the perfect couple, their connection and their story one that moved me deeply. From their initial meeting, to their eventual surrender, I was swept into the story and carried on an amazing journey. One full of color and the glorious description that I’ve come to expect from Juliette.
" Thank you so much!!! ❤❤❤ Thank you so much!!! ❤️❤️❤️ ...more "
" Thank you so much for the lovely review! I’m thrilled you enjoyed it! " " Thank you so much for the lovely, review! <3 "
" Thank you so much for the amazing review! ❤❤❤ Thank you so much for the amazing review! ❤️❤️❤️ ...more "
“Then maybe it's not a question of how different we are. Maybe I've been in a hurry my whole life to experience all the things I've done and seen for a reason." Thank you for the friend request and writing a great book! Thx 4 the friendship.Cheers 2 a long one!